Back in 2013 news came of several districts in NYC getting wired…or unwired rather. Ten commercial corridors got free Wi-Fi in New York City, under then Mayor Bloomberg, and were selected through the Wireless Corridor Challenge, led by the NYC Economic Development Corporation. That means that in December 2013, people were able to receive wireless internet in corridors in all five boroughs. Recently, the Flatiron Partnership, who has offered free wireless internet since 2011, announced substantial expansion of their existing Wi-Fi network in its two Public Plazas at Broadway, Fifth Avenue and 23rd Street. As noted by Flatiron Partnership’s Executive Director, Jennifer Brown, “The wireless corridor is an example of public/private partnership at its best, and further enhances the appeal of Flatiron as a destination in which to shop, dine and explore.” Flatiron Partnerships partnered with several area property owners and commercial businesses to launch the WiFi corridor as well as received funding from NYCEDC. This expansion further bolsters the corridor’s reputation as a hub of technology and innovation with many tech firms and startups in the area. 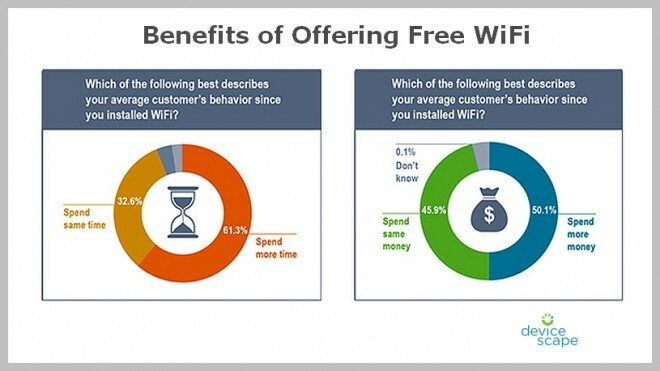 Moreover, offering free WiFi can have tangible benefits to businesses. Last year Devicescape commissioned a study by iGR of 400 small businesses that offered free WiFi to customers, including independent “mom and pop” retail stores like bars, restaurants, fast food places, coffee shops, clothing boutiques, book shops and salons. The results revealed that offering free WiFi increased foot traffic, the time customers on premises and the amount they spent in the stores. As customers are becoming ever more attached to computers and smartphone devices, offering continued access to the internet in commercial corridors does more than strengthen its reputation as an innovation hub, it can boost visitor traffic and demand. For a full list to see if the NYC corridor near you is connected or for more information click HERE.